There is no part of our bodies that fully rotates—be it a wrist or ankle or arm in a shoulder socket, we are made to twist only so far. And yet there is no more fundamental human invention than the wheel—a rotational mechanism that accomplishes what our physical form cannot. Throughout history, humans have developed technologies powered by human strength, complementing the physical abilities we have while overcoming our weaknesses. Providing a unique history of the wheel and other rotational devices—like cranks, cranes, carts, and capstans—Why the Wheel Is Round examines the contraptions and tricks we have devised in order to more efficiently move—and move through—the physical world. 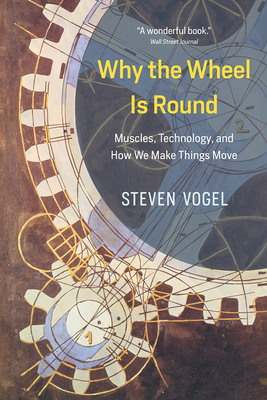 Steven Vogel combines his engineering expertise with his remarkable curiosity about how things work to explore how wheels and other mechanisms were, until very recently, powered by the push and pull of the muscles and skeletal systems of humans and other animals. Why the Wheel Is Round explores all manner of treadwheels, hand-spikes, gears, and more, as well as how these technologies diversified into such things as hand-held drills and hurdy-gurdies. Surprisingly, a number of these devices can be built out of everyday components and materials, and Vogel’s accessible and expansive book includes instructions and models so that inspired readers can even attempt to make their own muscle-powered technologies, like trebuchets and ballista. Appealing to anyone fascinated by the history of mechanics and technology as well as to hobbyists with home workshops, Why the Wheel Is Round offers a captivating exploration of our common technological heritage based on the simple concept of rotation. From our leg muscles powering the gears of a bicycle to our hands manipulating a mouse on a roller ball, it will be impossible to overlook the amazing feats of innovation behind our daily devices. Steven Vogel (1940–2015) was James B. Duke Professor Emeritus of biology at Duke University. He was one of the founders of comparative biomechanics and in more than ten books he defined and popularized the field. "Solidly researched and engagingly written."